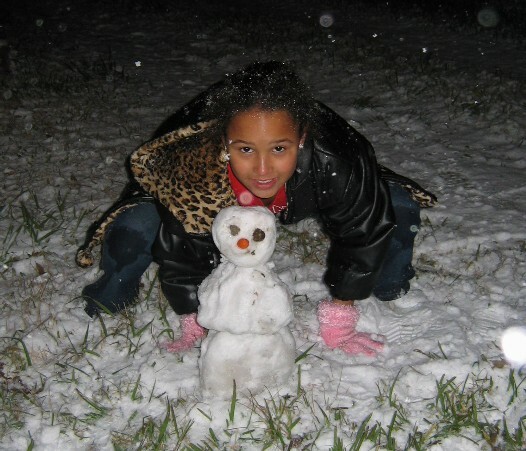 Snowfall in Houston is about as rare as a superbowl appearance. In all the years that I have lived in Texas since 1978, I have only seen it snow on one other occasion. 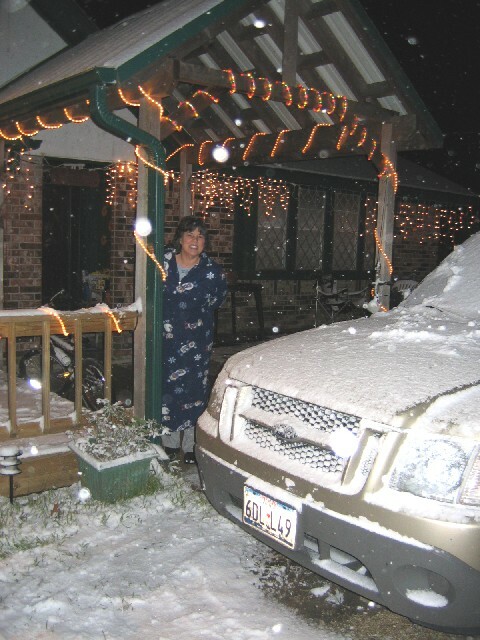 I first noticed a few random snow flurries during the afternoon on December 24, 2004 while I was driving to the grocery store. The outside air temperature was camped near 40 Deg. F all afternoon. The temperature later dropped to about 30 Deg. F shortly after sunset. Real snowflakes of the fluffy variety began to fall about 8:00pm, and continued to fall for several hours. The total accumulation reached about 1.0 inch in our neighborhood. Katie Beth and Jeremy had a good time playing in it. They scraped snow off my truck and collected enough to make snowballs to throw at each other. 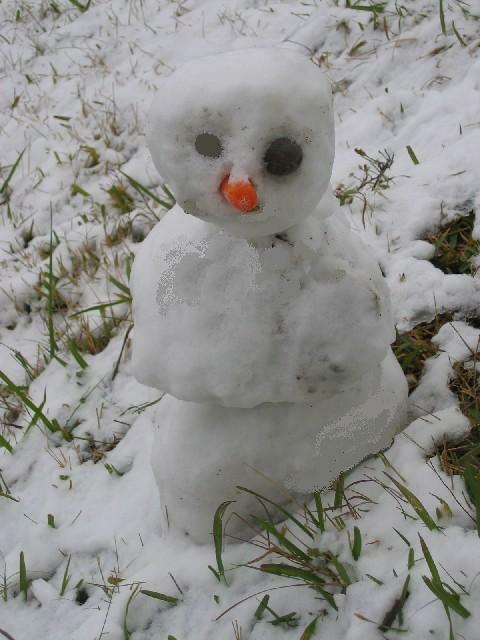 They also built a snowman which stood about one foot tall. 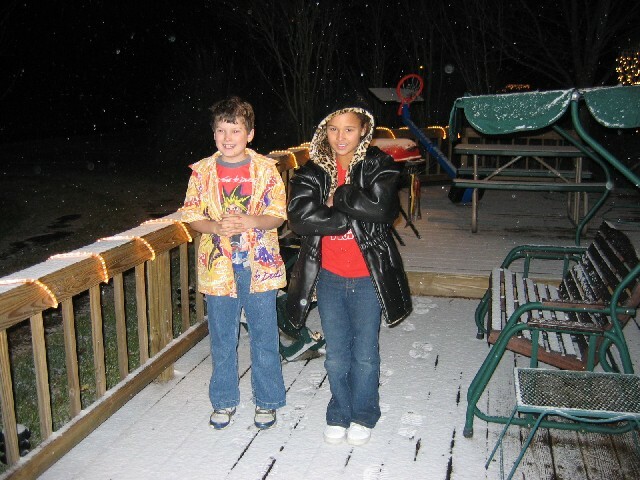 Katie Beth and Jeremy are on the front deck and just standing around trying to get acclimated to the cold weather. Jeremy later decides to put a jacket on. 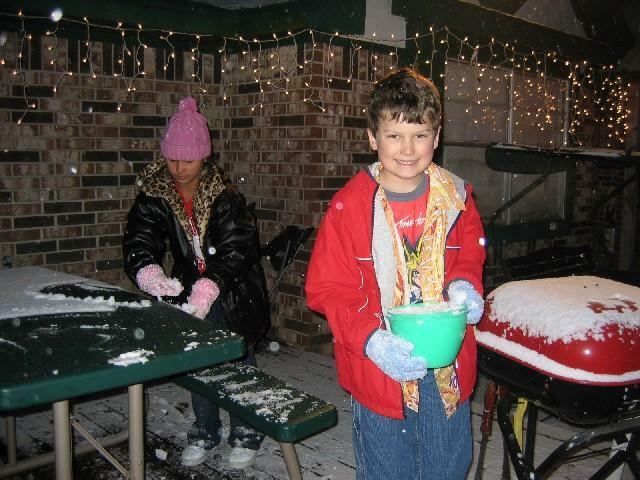 Katie Beth and Jeremy started collecting snow which had accumulated on the picnic table on the front deck. Jeremy has a tupperware bowl full of snow, which he later saved in the kitchen freezer to show the neighbors. just long enough to see the snow and experience a few photos. which she built with a little help from dad. which he helped Katie Beth to build. 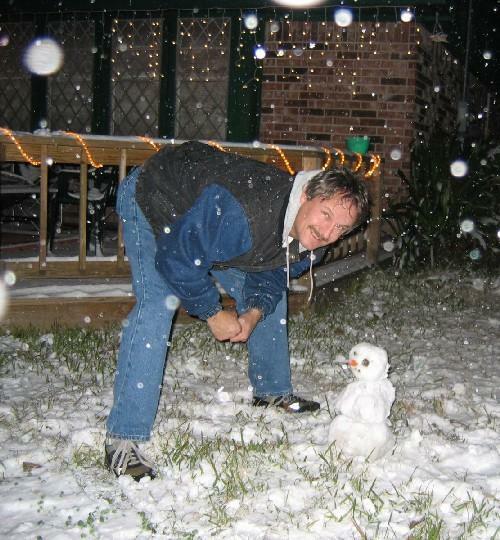 The snowman poses for a photo. He just sort of loitered on the front yard and stayed there like a watchdog overnight. I think he did a good job though because we had no buglarys overnight. Unfortunately he sublimed and melted the next day (on Christmas). 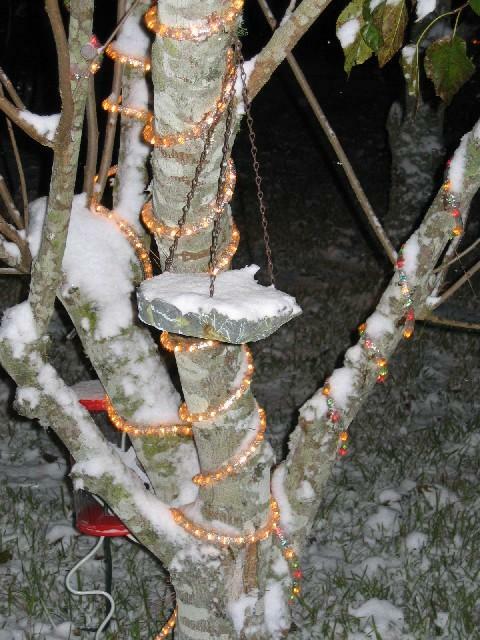 Snow accumulated in a bird bath hanging in one of the trees in the front yard. The Christmas lights continued shining in the tree. 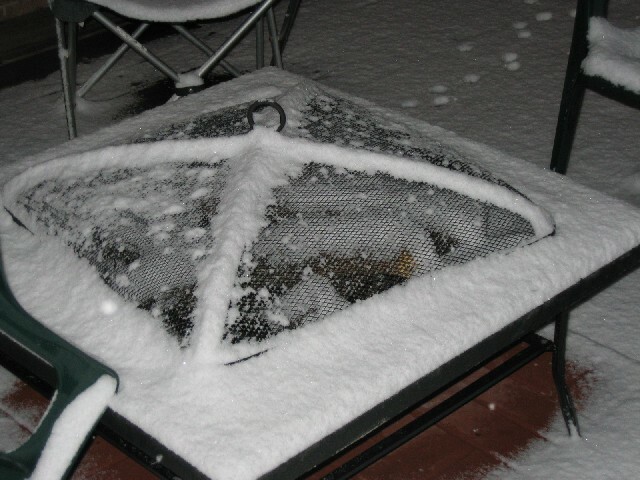 Snow accumulated on the firepit and cover setting on the front deck. 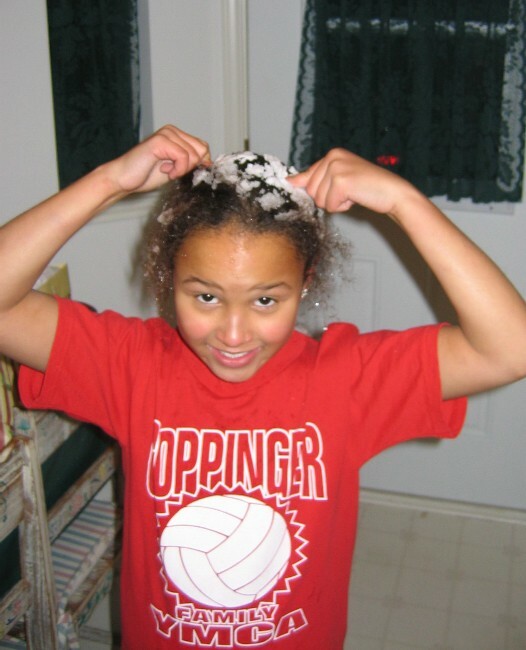 After an evening of fun in the snow, Katie Beth comes back into the house and tries to get the snow out of her hair. Early the next morning on Christmas Day, the snow started melting. 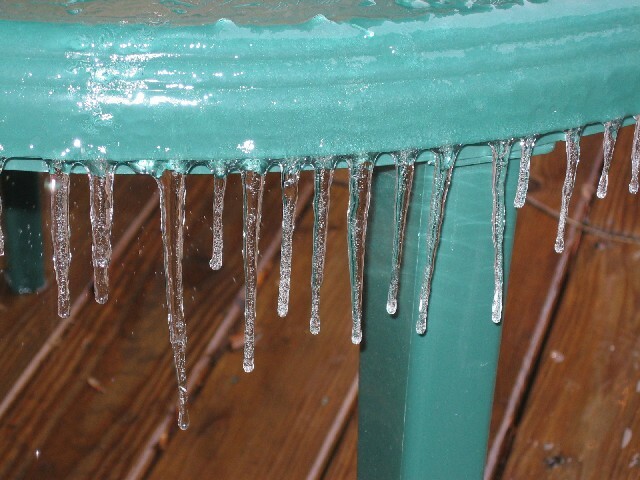 I saw a bunch of icycles hanging off one of the tables on the front deck.